This school year the district has teamed up with the Student Spaceflight Experiments Program hosted by Space X to give students in grades five through 12 the opportunity to send one of their unique experiments into the International Space Station. “Any Klein educator can be a team sponsor. Strongly consider sponsoring a team of interested students—remember that this is a student-owned challenge, and teams need a facilitator to connect them to resources,” Nicole Shepard said. In order to become a sponsor, an educator must fill out an interest form and join the required Schoology Course (Access Code: Z7JGQ-W3XQ5). “When you have a team of three to five students, complete the Entry Form with students names by Monday, Sept 17,” Shepard said. 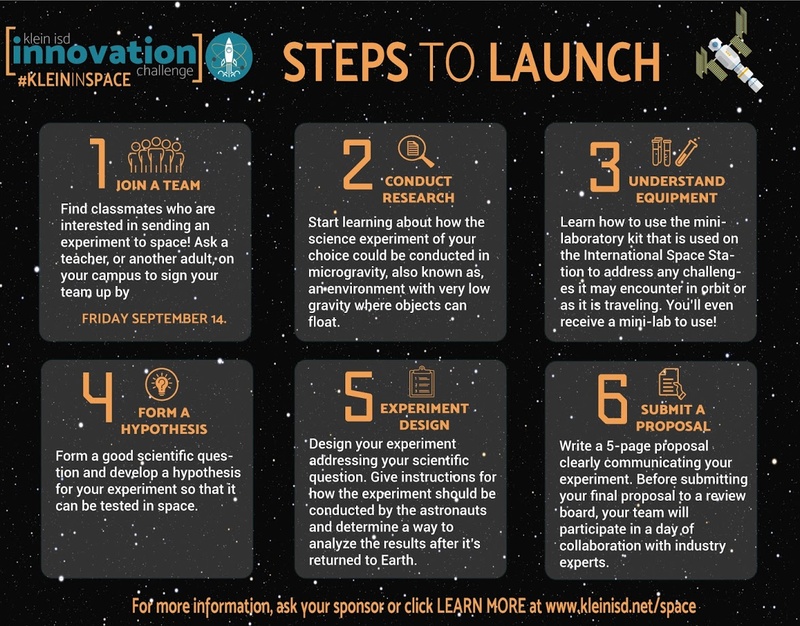 Teams of students should design an experiment, and the winning team will have their experiment go on the SpaceX Falcon 9 Rocket headed to the International Space Station. They’ll be heading to Cape Canaveral, Florida in March 2019 so they can see their experiment leave the Earth and on to the International Space Station. “Each sponsor will have access to a Schoology course with weekly checklists, resources for your team, and a discussion board for Q&A. All proposals will be reviewed by a panel of community members, and the top three will be sent off to SSEP where one lucky team will be selected to have their proposal become a reality,” Yancey said. Update: The date to submit entries for each team has been extended to Sept 17.